Many new and revised requirements in the 2014 Spanish edition of the NEC® impact residential, commercial, and industrial electrical installations. 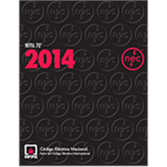 The 2014 Spanish edition of NFPA 70®: NEC® covers the latest requirements on electrical wiring and equipment installation issues, including minimum provisions for the use of connections, voltage markings, conductors, and cables. Chapters address specific circumstances surrounding special occupancies and industrial equipment and machines. It also contains specific details on the safe installation and use of communications and signaling conductors. The Spanish NEC 70 provides the most comprehensive set of rules for all types of electrical wiring and equipment. Interested in the 2008 Spanish edition of the NEC? Use the drop down menu above to select it.